Hello there, this will be my very first post about nail-art tutorial. 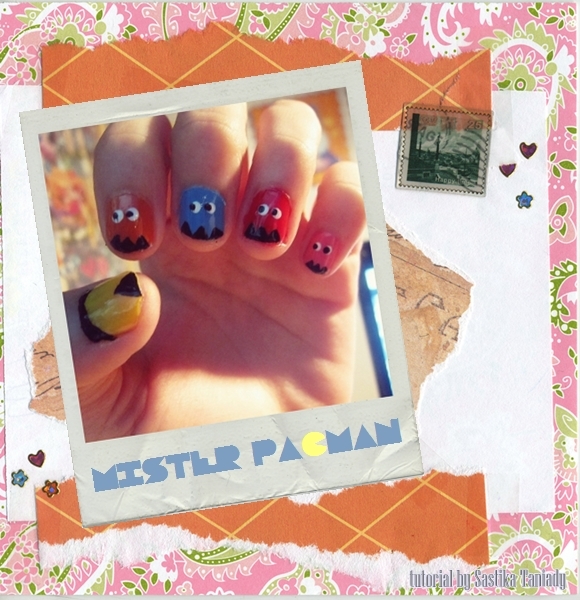 As I stated before on this post, nail art has become one of my biggest interest, especially these past few months and today I'm gonna give you all a super duper easy but very cute and fun Pacman nail-art. But but but before let me inform you a very important thing, I am no professional (yet) in this nail-art thing so please do not mind the the messiness I still always made LOL. Now let's just start, shall we? The nail polishes (of course), here I was using 6 colors; pink, red, blue, orange, yellow, black and WHITE (forgot the white one when I took this picture zZz). Painting brush, the small one's better so that it will be easier to draw the details. 2. Let them dry, and now we're just working with the four fingers (excluded thumb) to draw the "monsters". What we need to do now is to draw three small triangles at the tip of each finger with the black polish as the feet(?) of the monsters (refer to picture). 3. The next thing we're going to do is to make the eyes. Get your dotting tool and dot each nails with two dots with the white polish on it. 4. Now that the four fingers are done, we're going to work on the thumb (the Pacman) and what I was doing at first was drawing the circle outline of the Pacman with the black polish. After we got this outline, all we have to do is simply color the rest with the nail polish. 5. When you're done with all of the steps, IT'S TIME FOR TOP COAT! Super duper easy, didn't I say it already? :D I was really having fun at the first time I was drawing these nails, but since this already was the second time I draw these, I was not as excited as I used to, so they weren't as neat as the first time I made them, but I still love these kiddos a lot. Colorful, just perfect for summer look, don't you think? By the way, this is a animated gif of the nail-art process. Before you start drawing, it will be better for you to find references about the things you wanted to draw, for example when I was about to draw the Pacman nails, I did do some "research" on Google, like what colors the monsters are, and whether the Pacman has eye or not (and found out it doesn't). This will be really helpful for your whole process of nail drawing. This is really important, always go to the bathroom before you start painting. Trust me it will be a lot of trouble when your nail polish is still wet yet you need to go to bathroom. Expensive products do not always mean the best product. At first I was using a Chinese brand nail polish remover and it turned out fine, but when I changed to O.P.I's Expert Touch Lacquer Remover, it turned my nails yellow ugh. I am now back to my not-so-expensive polish remover. Those are all I can come up with tonight, can't think about any other things. Well I hope you find this tutorial helpful, and if you're willing, you can take a visit at my nail diary tumblr here and you may follow it if you like it hehe. Feel free to drop me some comments or feedback. I will really really appreciate them. Hope that this won't be the first and the last tutorial I'm making #fingerscrossed Thank you and good night, fellas.